Sunday sees the last in the Foodtalk series with Garden being the theme of the final show. We travelled to Clonegal, Co Carlow to meet with Henry Stone of the Sha-Roe Bistro and then to Nohoval in Cork to talk to Ultan Walsh of Gort na Nain Vegetarian Guesthouse and Organic Farm. I stayed at Gort na Nain back in May and was only too delighted to have an excuse to return and talk to Ultan at length about the vegetables that he grows (Denis Cotter of Café Paradiso is a big fan too – check out his last book, Wild Garlic, Gooseberries…and Me). 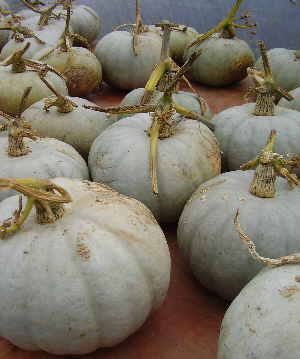 There wasn’t so much going on in the polytunnels at that stage in the year but I did get to admire Ultan’s magnificant crop of Crown Prince squash, all sitting around on benches in one of his polytunnels, just seasoning in the dry before they get stored. I had a close encounter with them on New Year’s Eve as well, when I was sitting next to a display of Crown Prince in the window of Café Paradiso. What else could I pick for my main course other than a squash gratin, which came with walnut and gingered kale, lemon-cumin cream and star anise-braised salsify. The Sunday that we had lunch at the Sha-Roe Bistro proved to me that sometimes it’s worth travelling a distance for food, although driving 2½ hours for a meal isn’t something I wish to make a habit out of. In this case, however, it was more than justified. The Husband and I arrived first so we had plenty of time to relax beforehand in the elegant reception area and toast ourselves at the roaring fire. We were joined by the Producer, his father and girlfriend for a delicious lunch, made all the more memorable by the fact that we were seated at the chef’s table, right next to the kitchen so we could watch Henry as he cooked. Every mouthful was a pleasure, with tastings being swapped around the table – nobody’s dinner was safe! After much testing, we figured that the ultimate dinner would be the Wild Pheasant and Apple Burger (the Husband’s choice), followed by the meltingly tender Slow Roasted Pork Belly (my lucky pick) but the desert would be a toss up. I had the Fig Tart Tatin, which came with Toffee Ice Cream, but there were lots of other tempting options. A leisurely, hospitable three course Sunday lunch is just €34. Irish Food Bloggers Association: happy birthday to us! Thanks Anna! Foodtalk was a great series to work on, made much easier by having such passionate people to talk to. I had a fantastic time travelling around the country to talk to everyone and, of course, there was plenty of eating involved! 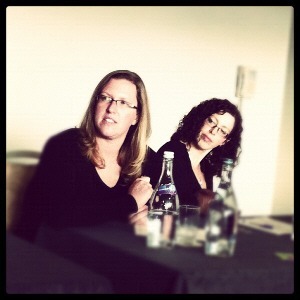 Caroline: I have really been enjoying your blog, and it was great to listen to the podcasts- very well done. I live in Boston (USA) and think Ireland has some of the best food I have ever eaten. Your Foodtalk program was so authentic and it was as if was back there myself. Keep up the great work! Caroline: I just listened to the final foodtalk series this morning. It was great, but I kept thinking how it was the last one and I wish there were more. Any chance of other ones? Maybe you could interview different chefs or suppliers so that we can better understand the complete aspect of the foods we eat and the places we dine in? Just a thought! Given half a chance, Ellen, I’d love to do just that. The series was a pleasure to work on. I learned so much from the people that I spoke to and it definitely opened my eyes to the difficulties that many of our producers have. Maybe you should drop Newstalk a line and see if they’ll commission a new series!